White Heat is a classic gangster film from 1949, starring James Cagney. It is a thoroughly Los Angeles flick, filmed almost exclusively in the Greater Los Angeles region, including scenes shot at Warner Brother Studios in Burbank. The film is considered a classic for many reasons—but what's interesting in terms of Gizmodo is its depiction of, at the time, cutting-edge technologies that were adapted by the police to track down Cagney's gang. 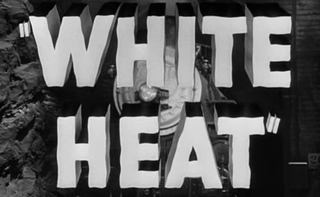 Much of the tech used in the film was already—at least in part—in use at the time, but the representation and mixing of these technologies in White Heat is surprisingly forward-thinking and worth breaking down a bit. The film seems to progress from the oldest forms of technology to the newest. Here, for example, we see a death-mask taken off a member of Cagney's crew. The drive to preserve bodily form, whether for forensics or for posterity, has surfaced in the form of 3D scanning and printing, where one can now have 3D copies made of yourself, your pets, and even landscapes. In the very next scene, a forensics officer produces a spectrograph of dust from the tunnel, comparing it to a spectrograph of the dust from the dead man's clothes. What you don't see is the spectrophotometer used to take the spectrograph. This same technology is used today as it was in the 1940s—and, in fact, earlier—for detecting and measuring light in the electromagnetic spectrum. This particular application had its origin during WWII, looking at the structure of molecules to produce synthetic rubber. Applications today range from chemistry to physics, and it still has a use in criminology. In this scene, Cagney's mother is being trailed. Her car has been "tagged" by a comically large piece of cloth, which is nonetheless supposed to be incognito. The resulting car chase is notable for some nifty police radio work and scenes of old Los Angeles neighborhoods. The radio work here is a good foreshadow of the primitive GPS tracking that will be used later in the film, accomplished via radio and directional tracking. The chase ends with mom getting away with Cagney and his wife in the now demolished San Val Drive-In theatre. Later on, the officers at the Los Angeles division of the Treasury Department begin to hatch a plan to catch Cagney. Here they make use of a primitive GPS of sorts, cobbled together from receivers and oscillators to cross-plot the location of the bugged getaway car. Interestingly, at the end of the scene, the electronics expert in the room quips that you could make one of the oscillators out of a bedside radio. Which, of course, is more or less exactly what happens. When the initial plan to trap Cagney falls apart, Hank Fallon—who plays the classic role of the undercover cop—has a plan. After all, he is also an electronics expert: he thus hacks and modifies an existing radio set to fabricate an oscillator that will transmit on an agreed-upon signal, 47.1. However, en route to the final heist, communication breaks down and agent Fallon is left with no way to tip off the cops; he thus has to leave an analog note on a bathroom mirror so that the authorities can tune in and find him. When all else fails there is always the hand-written note! In any case, once the authorities tune in, they dispatch FCC direction-finding cars that will help to triangulate the location of Cagney and his crew—who are, as it happens, on their way to break into a chemical plant in Long Beach (filmed on location in Torrance). Interestingly enough, this technology already existed for some time and had been used for the navigation of ships—but, again, here in White Heat all sorts of technology is being re-purposed for use on the city streets. In a sense, all of this belongs to the same family tree of tech that fuels Google's mapping cars, backpacks like Trekker, and sea-mapping projects like Catlin Seaview. The film comes to its technological crescendo when we get a glimpse into the inner workings of the direction-finder cars, zooming in on their dials, spinning rooftop signal detectors, and headsets, as officer takes longhand notes to keep up. They work in unison, communicating back to the base, presumably somewhere in Downtown Los Angeles, as they painstakingly triangulate the location of Cagney and his crew. What ensues is—if your know your Los Angeles cross-streets well enough—thrilling, as the cops track Cagney down past La Canada & Verdugo to Main & Atlantic, and all the way down finally to 198th and Figueroa (which I could not find on the map). White Heat then ultimately comes to a predictable finale. However, it's the film's use of technology that feels so surprisingly futuristic. It depicts a fictional Los Angeles in which all of these tracking devices and radio-based surveillance mechanisms feel like they had already been there for some time; their integration into everyday police work is very naturalistic and, when things do go wrong, their necessary parts and components can all be repurposed from a common bedside radio, as if the advanced technology of the future had been hiding in plain view all along.